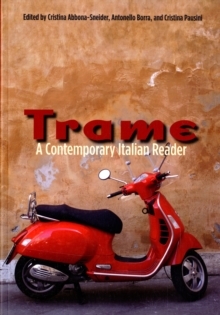 Trame: A Contemporary Italian Reader brings together short stories, poems, interviews, excerpts from movie scripts and novels, and other works by 33 renowned authors. The readings cover familiar themes-youth, family, immigration, politics, women's voices, identity-from the fresh perspective of a new generation of Italian writers. By presenting a rich array of materials and many points of view, Tramehighlights the cultural complexity of contemporary Italy. Each text is accompanied by a diverse selection of activities and exercises that help students read authentic texts and build their language skills. These include:pre-reading activities that introduce important themes;vocabulary lists with definitions in Italian;writing exercises;post-reading activities in discussion and analysis. With its range of readings and exercises, Trame is designed to be easily adaptable to instructors' different needs and class levels. It is ideally suited to high-intermediate and advanced Italian language and culture courses.